Get ready for the start of your Eckerd educational experience before you arrive for Autumn Term check-in August 9, 2019. Each room has cable available with around 70 channels. There are televisions in the lounges, but if it’s possible, it’s nice to have one in your room. While Eckerd provides basic cable as a standard service, students are now able to order Premium Digital Cable and more directly from Bright House Networks all at a discounted student rate. If you have a computer or are thinking about getting one, it’s a great idea and there is plenty of space. You’ll find minimum requirements and lots more information on the Information Technology Services site. If you buy a small fridge (roughly between $50.00 and $90.00) and use it for your four years at Eckerd, you can donate it to our Trash 2 Treasure sale before you graduate. Renting is much more expensive, costing at least $60.00 per year. Eckerd College has yellow “community bicycles” available for use on campus only as part of the bike program. These are wonderful for getting around campus. Eckerd also has six white bicycles that are available for students to take off campus. However, you will still want to consider bringing your own bike as these are all very popular. There’s plenty to do within a few miles of campus and many bike trails for the more serious rider. Florida’s flat terrain makes biking easy. We strongly encourage each student to bring a personal bike. If you don’t own one, you can purchase one at any of the bike shops in the Tampa Bay area, including the Nu Bicycle Shop on campus. ABC Bicycles and iRideUsedBicycles provide bike discounts to Eckerd students. The Nu Bicycle Shop on campus is open 1:00-5:00pm Monday through Friday. For more serious repairs, we encourage students to go to an off campus shop. Skateboards are also a popular item on campus. The roads on campus are paved and in pretty good shape. If you have a skateboard, bring it along! First year students are allowed to keep cars on campus. All cars must be registered with campus safety during Autumn Term. The parking permit is $110.00 and will guarantee you parking for one school year. For those who do not have a car, or those who are not a fan of biking – you are in luck. There is a public bus stop on campus. Fares are reasonable and you can buy an all day pass or monthly unlimited passes. You can ride the bus to the beaches, downtown St. Petersburg, Tyrone Mall and Clearwater. Check out the Pinellas Suncoast Transit Authority website for more information. Or check out our U-Haul Car Share program where students can rent out one of four on-campus vehicles for personal use. If you would like to ship a few boxes to campus in advance, you are permitted to mail a maximum of 5 boxes to your Eckerd mailbox number. Make sure they arrive after July 31st. Students will receive their mailbox number and mailing instructions in mid July. The only time that students generally move out of their rooms is during summer break. From time to time, freshman are asked to move their belongings for the winter term if they don’t plan to be on campus and their room is needed for winter term visiting students. Basically, once you move in, it’s your room and your space. During the summer, there are some great storage places within 1 to 4 miles of campus. Many students will share storage space with friends. Costs can range from $30.00 to $60.00 for the summer, depending on how many people are storing together. Within the group, a few will have cars available and will help get everyone’s items to the storage area. For those interested in maintaining a small storage space throughout the school year (for those with lots of luggage or other large items that might be inconvenient in a dorm room) and for everyone else to keep in mind for the spring, you may contact one of the following local storage facilities to investigate their offerings. PODS can be delivered on campus for mobile storage. We have partnered with Collegiate Concepts to provide students with a bed lofting and microfridge rental option. Renting a bed loft is an easy, affordable way to create additional living space in your room. Microfridge units are energy star rated and consist of a microwave oven, refrigerator, and a zero degree true freezer, all in one integrated unit. As part of the program, your rented Bed Loft and/or Microfridge will be delivered to your room before your arrival to campus and picked up at the end of the academic year. You must have a confirmed residence hall and room assignment before orders can be placed. To place your order go to www.collegiateconcepts.net and select Eckerd College from the “Select Your School” drop down menu. Eckerd College has worked closely with the Residence Hall Linens program for well over 21 years. This partnership has offered students, and their families, a peace of mind when it comes to making those first “home away from home” purchases such as bedding, bath supplies, room décor, storage options and other necessary items. Since the residence hall rooms at Eckerd College have extra-long mattresses, which require specially-sized sheets, blankets and comforters, the Residence Hall Linen program takes the worry out of searching at local department stores to find the “right” bedding. Eckerd College has partnered with National Student Services, Inc. (NSSI) to provide students with their own personal property insurance while living in their home away from home. NSSI provides students with insurance designed for them. You can receive a free quote online or call (800) 256-6774 to speak with a customer service representative. Renters insurance is typically less than the cost of a homeowner’s deductible and typically offers better coverage at affordable rates. This property insurance covers many personal items such as laptops, cell phones, tablets, clothes, TVs and much more. Please note this schedule is tentative. During check-in, students will complete their financial clearance, be issued a student identification card, obtain a key for their residence hall room, and register their vehicles. If your student’s computer is set up, but he/she is unable to connect to the campus network, call x8318. The Information Technology Services (ITS) staff will be glad to assist. Make sure your student purchases books for tomorrow’s class and for freshmen, Human Experience. Mentors are looking forward to meeting students and their families during this session. All students and their families are invited to attend this candle light ceremony symbolizing new students joining the Eckerd College community of scholars. Everyone is invited to enjoy a refreshing summer picnic with students, families, faculty, and staff. **All students and their families should plan to attend these events together. Family members will enjoy a continental breakfast and the opportunity to meet with and ask questions of College leadership. Texts for Human Experience are available for first-year students. Check out other cool Triton gear! Barbara Rhode, LMFT, and Annette Reiter, LMFT, present an interactive program focused on the inevitable shift in power that takes place when a son or daughter prepares to leave home…and then does. Participants will learn how to discern unhealthy dependency issues (theirs and the student’s!) while also understanding how to remain emotionally connected when there are miles in between. Check out the exciting amenities the Waterfront has to offer! Venture on a boat ride or just hang out and enjoy Eckerd’s beautiful location on Boca Ciega Bay. This is a great time for students and families to take a swim test so you can kayak or even sail with your student on your next visit! Students will complete their financial clearance, be issued a Student Identification card, obtain a key for their residence hall room, and register their vehicles. Once all of these are taken care of you can officially move into your dorm room. If your computer is set up but you are having trouble connecting it to the campus network, call 727-864-8318. The Information Technology Services (ITS) staff will be glad to assist you. Mandatory – Buy books for tomorrow’s class! Freshmen do not forget you need books for Human Experience for fall semester. 4:10 p.m. – 5 p.m.
Mentor Meetings for ALL students and their families. Students will receive their class medallion and be seated for the Ceremony of Lights. This ceremony symbolizes new students becoming part of the Eckerd College community of scholars. Bon Appétit will be setting up a lovely summer picnic and giving students, their families, faculty, and staff an opportunity to eat, mingle, and talk about the Eckerd experience. Meet your Resident Advisor and start discussing how to live together comfortably and considerately in college housing. Mandatory – Buy your Human Experience and Autumn Term texts, if you haven’t done so already. Class – Only students should attend this class. This meeting of your Autumn Term course is absolutely, totally, and completely MANDATORY, like all Autumn Term classes! After all, who would want to miss their very first college class? All international students and families are invited to stop by and visit with Olivier Debure, Coordinator of International Student Affairs. During this meeting, you will be able to ask questions about obtaining a driver’s license, insurance, working on campus or any other concerns you still might have. If your computer is set up and you are having trouble connecting it to the campus network, call 727-864-8318. The Information Technology Services (ITS) staff will be glad to assist you. 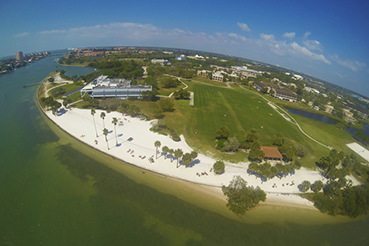 Check out Eckerd’s awesome Waterfront! Meet with Waterfront Staff and enjoy Eckerd’s beautiful location on Boca Ciega Bay. This is a great time to get your swim test (parents, too!) so you can use the Waterfront facilities! Forgot your toothbrush or your pillow? We’ll take you to pick up essentials. Meet in front of the mailboxes. Sponsored by Campus Activities. Come out for your first Eckerd gathering as we turn Fox Hall into a day-glow nightclub. Dance the night away at our Video Dance Party. Sponsored by ECOS/Palmetto Productions and Student Affairs. Come to Ft. De Soto Park for a day at the beach and an opportunity to explore the historic fort and surrounding marine ecosystems. The cafeteria will be closed, and we will be enjoying lunch out at the pavilion. Bring your towel and sunscreen! We will be leaving from in front of the mailboxes with continuous shuttle service throughout the afternoon; directions will be provided for anyone who carpools. This is an Additional Portfolio Event. Remember – You should devote at least 4 hours per day to preparing for your Autumn Term class. There are so many opportunities to become active in campus life here at Eckerd. A great way is to dive into one of the many branches of the Eckerd College Organization of Students (ECOS). Find out how to run for Student Senate, get involved in Pet Council, serve on the Student Community Standards Board, and more. This is an Additional Portfolio Event. Bursar & Financial Aid Offices: You will have a chance to meet with representatives from both the Bursar’s Office and Financial Aid to complete check-in. Campus Safety: For on-campus residential students, you will receive your room key and front door key code. All students will be photographed for their Student Identification Card and will have an opportunity to register motor vehicles, boats and bicycles. Counseling and Health Services: You will discuss required immunizations and health forms that are needed to complete check-in. Stop by the Campus Bookstore, located in Edmundson Hall, to buy your books before your first day of class. Meet with Dean of Faculty Suzan Harrison, Dean of Students Jim Annarelli Associate Dean of Faculty Marjorie Sanfilippo, Registrar Amy Apicerno, Collegial Chairs, and staff and students in Fox Hall to learn important information to help you succeed while at Eckerd College. Following the information session, it is mandatory that you meet with your Collegial Chair and schedule an appointment with your mentor. *Families are invited to attend. Being part of a community of 1,900 college students presents some unique challenges. Staff will talk with you about finding your place in this community, adjusting to life in the residence halls, staying healthy while in college, making responsible choices about alcohol and other drugs, and knowing how and when to get help for yourself or a friend. You will also become familiar with the various health resources available to you. Join the Office of Service-Learning for a presentation that focuses on the Reflective Service Learning requirement and the exciting opportunities offered by the Office of Service Learning. International students need to stop by the Office of Multicultural Affairs, located in Fox Hall adjacent to the patio, to meet with Olivier Debure, Director of International Student Services. Eckerd College Organization of Students (ECOS) welcomes you to your new home with a student social complete with appetizers, drinks and entertainment. You will have a chance to ask about ways to be involved on campus, learn about the 100 registered clubs and organizations, and have all your questions answered. Don’t miss this opportunity to meet your student leaders! Meet your mentor and register for your Fall courses. Following the meeting, the Registrar’s Office, located in Upham, will be open until 5 p.m. to assist you with online registration if you have problems or questions. You’ll meet Eckerd’s friendly and helpful librarians and discover what services and research tools the library has to offer. Stop by the Office of Campus Activities to pick up your complimentary ticket to see a movie in downtown St. Petersburg. Transportation shuttles will be leaving from the mailboxes beginning at 8 p.m.; directions will be provided for anyone who carpools. Do you like food, music, waterslides, crazy games, chillin’ on rafts with your friends? Then come to down to fill up and cool off at the Waterfront for this final Waterfront Autumn Term event. There are two airports within 20-25 minutes of campus that serve the Tampa Bay area. TPA handles a large volume of flights and handles most airline carriers. PIE is a smaller terminal that serves fewer airline carriers. How should we get from the airport to Eckerd? Super Shuttle serves both Tampa International and St. Petersburg/Clearwater airports. Students and guests can schedule this transportation in advance by contacting Super Shuttle. Super Shuttle may also be scheduled on the baggage claim levels at the ground transportation area when you arrive at the airport. As a van service, it’s important to know that most vans don’t leave the airport until they have acquired at least 4 to 6 passengers. For this reason, you may not leave the airport immediately. We encourage you to estimate your arrival at Eckerd between an hour and an hour and a half from the time that your plane lands at the airport. Both airports also offer rental car services. Tampa International has sixteen rental car companies located on the property: Avis, Budget, Payless, Zipcar; Enterprise, Alamo, National; Hertz, Dollar, Thrifty; Ace; Advantage; E-Z; Executive; Fox; Sixt. St. Petersburg/Clearwater airport offers service from the following rental car companies: Alamo, Avis, Budget, Enterprise, Hertz and National. 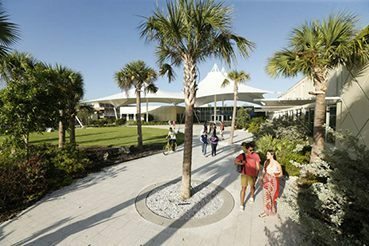 Right off of Interstate 275, Eckerd’s campus is easy to find! For specific driving directions, utilize Google Maps here. Uber is a downloadable app for users on Android, Apple iOS, and Windows Phones. Uber connects riders with drivers using their phone’s GPS capabilities and provides users with a reliable, safe form of transportation. Use their website to get a fare estimate to see what it might cost you here. When should we arrive and depart and where should we stay? Although you will not be able to move into your residence hall until Autumn Term check in, many families choose to arrive early and stay in the area. They enjoy the extra time to rest and recharge before check-in as well as to pick up any last-minute items not purchased at home. Once Autumn Term begins, families will either leave Saturday afternoon or on Sunday. Please consult the parent schedule for specific details. There are quite a few hotel options in the local area. A list of recommended hotels can be found on our Parents page. If you’re considering a hotel that is not listed, please feel free to contact the Admissions Office at 727-864-8331 if you would like information regarding the hotel’s location, surrounding area and proximity to the College. If you plan to be in the area longer than a couple of nights, we would recommend that you consider renting a condominium or house as the cost may be equal to or less than many nights in a hotel and it would provide a full kitchen and more space. The following real estate agencies provide rental information for the local area. 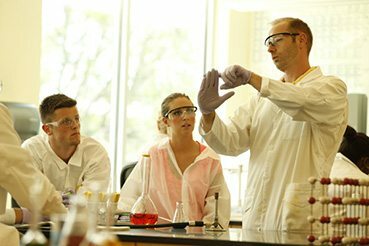 Students will attend their first class on Saturday while parents may attend the President’s breakfast and other orientation activities. You may not move into the residence halls until Friday, August 9. If you will be driving to St. Petersburg and anticipate that you will have items to store for a few days, please contact Spare Room Mini Storage, Inc. Their phone number is (727) 866-9357.
International student? Please have a look at this pre-arrival checklist we put together just for you. Of course, we can’t cover everything, so if you didn’t find what you are looking for, please contact your admission counselor for more details.